The other week, one of our priests stepped out of the raid for someone else after a wipe. Inexplicably, his body floated there long after he'd gone. It was creepy. 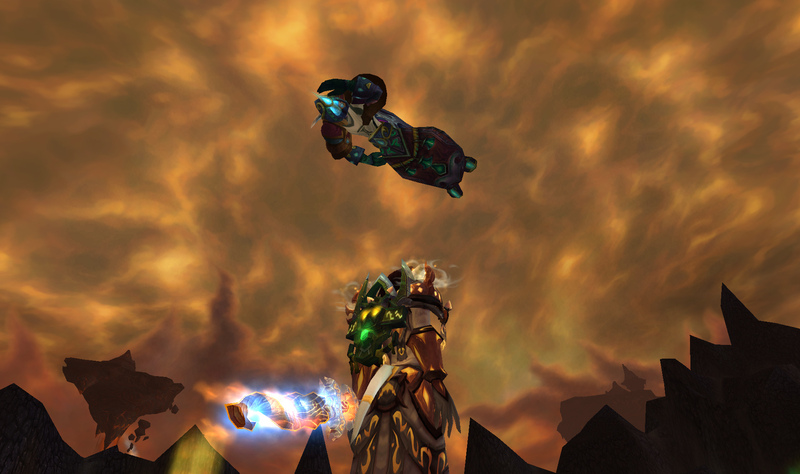 Our rezzes are so powerful they grant levitation! I just wanted to post quickly to mention another podcast I was on recently, My Epic Heals. Eade and Wolfshade were our gracious hosts and I was there along with Kurn from Kurn’s Corner. It’s an episode about holy paladin healing. We talked about Ragnaros and a bunch of other stuff if you want to give it a listen. Also note, in case you missed it, my silly paper dolls post from the other day! I probably would have ordinarily saved that post for today, but I’m impatient like that, so instead it was posted a few days back. Last year, for the first time I paid for the Blizzcon “virtual ticket” so that I could follow along with the Blizzcon action as my Twitter feed was filled with excited attendees meeting up and having drinks. I really enjoyed the opportunity to see some behind the scenes stuff (the art and cinematics panels were my favourites!) and listen to the devs answer some questions. Unfortunately, it wasn’t entirely fun to watch because some of the flippant replies earned my ire at the time. A woman who asked if we could have female characters that didn’t look like they’d stepped from the pages of a lingerie catalog was asked, “Well, what kind of catalog do you want them to have stepped out of?” You could see her face mirroring the feelings I had as this line of men mocked her question. Disbelief, followed by embarrassment, followed by resignation and a shrug as she stepped away from the microphone. By that time, the “answer” had degenerated into tasteless jokes about female Tauren coming from an agriculture magazine or catalog. It was disappointing to see that a serious question was not taken at all seriously. There are entire blogs devoted to the way female characters in games are portrayed. Women that actually play games? We’d like to know that our important organs are protected when we step into battle. Even gamers that are not women don’t necessarily like their characters to have exposed midriff for no real reason. I’m digressing, though, because my post isn’t actually about this question, but another reply that made me roll my eyes. The question and answer I’m referring to happen at around 9:39, so you’ll have to do a bit of scrolling to get there. For those who can’t be bothered, here’s a transcript: (also, big thanks to Wolfshead who wrote about this at the time of the last Blizzcon; the commentary on this entry helped me to relocate the question and answer once I knew exactly which developers were involved). Woman asking question: I would like to ask for a closet. Something similar to a keychain. We’ve got all these wonderful festival items, and midsummer night, and all that stuff, and no place to put ’em! Tom Chilton: Yeah, that’s actually something that we had hoped to get in with Cataclysm. It’s really more a question of resolving data storage, and exactly what the interface is, and all that kinda stuff. But it is something we’d like to do at some point. J. Allen Brack: What I’m interested in, is how excited are you guys to play “World of Dresscraft”? Now, almost a year later, as the next Blizzcon looms, much has changed. Lo and behold, we’re getting a virtual closet. We’re also getting the ability to modify our gear. I don’t know about you guys, but the reactions I’ve been seeing to this have been uproarious. My guild has been furiously running old content to get specific set pieces – and we’re not talking about RPers here. We’re a raiding guild. I’ve been saving tier gear all this time out of long abandoned RP pursuits, but also because I just like doing it. My bank is all dresses. Tom Chilton gave a really respectful and honest reply to a valid question. Bank limitations are a problem for pretty much everyone, I’d imagine. I don’t think I’ve ever seen so much enthusiasm for an upcoming change before! So I’d say: I’ll let the community’s response answer your question, Mr. Brack. Right after I watched this Q & A, I started working on a small side-project for fun. Naturally, it could have only one name: World of Dresscraft. This is the result. SO EXCITED. CAN'T EVEN TELL YOU. Patch 4.3 not coming quickly enough for you? 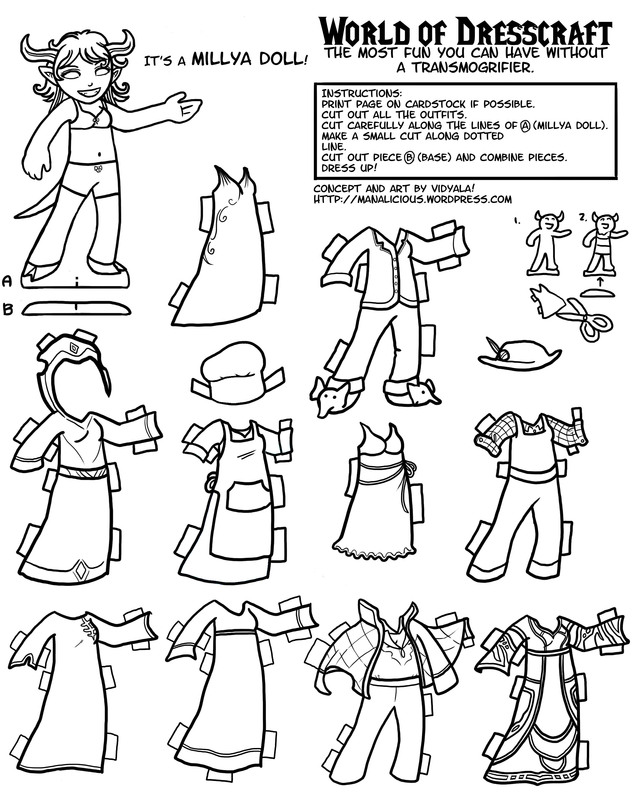 Help shorten the wait by taking your love of World of Dresscraft into the third dimension with a fully functional paper Millya doll (and assorted outfits!). Millya is never without an outfit for every occasion. She has fancy dresses, spring dresses, Kirin Tor robes, Draenic Silk Robes (lovingly crafted for Modoru by his grandmother, they’re an heirloom, you know) and even an odd outfit she borrowed from another wizard she met once. 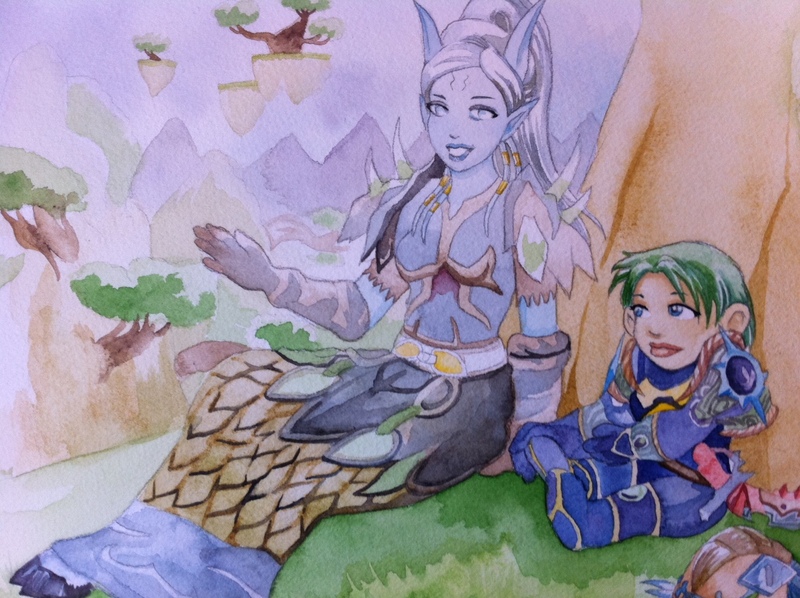 There are outfits for fishing and baking, killing Horde, and of course some pyjamas with mage cakes and pink elekk slippers. Both of these images should be suitable for output on standard (8.5″ x 11″) paper. I’d recommend printing them on matte photo paper, cardstock, or some other heftier paper. If you don’t have that option, you can always print out and glue them onto something sturdier. Speaking from experience, it is possible to assemble them using plain old’ printer paper, but she won’t stand up really well. If you have any questions or comments I’d love to hear them! 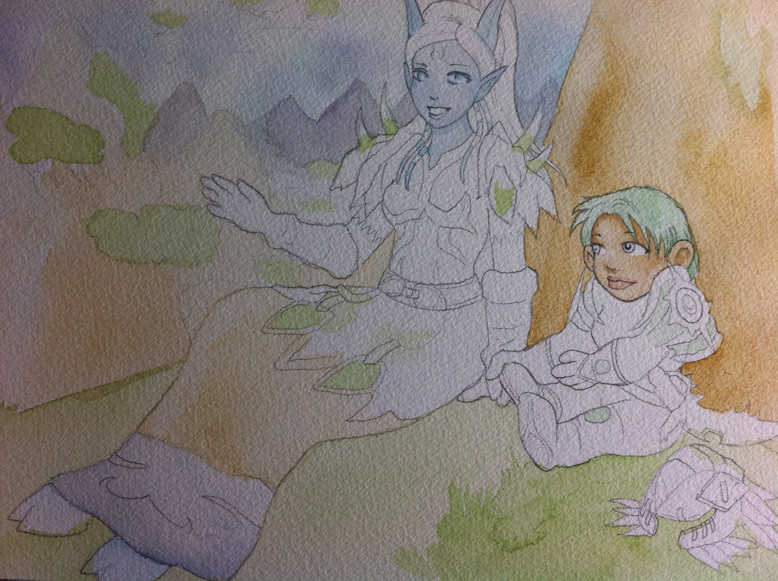 The cutting is pretty fiddly, especially Millya’s hair, but it’s just the way her hair is. If you have access to an x-acto knife you might have an easier time using that for the cutting, although it is doable with scissors. I’d never made anything like this before so constructive feedback will be helpful. If I end up doing any more, I can make sure my next one incorporates any suggestions! After all, World of Dresscraft is a vast universe full of many possibilities! I found this entry in my draft folder from June! 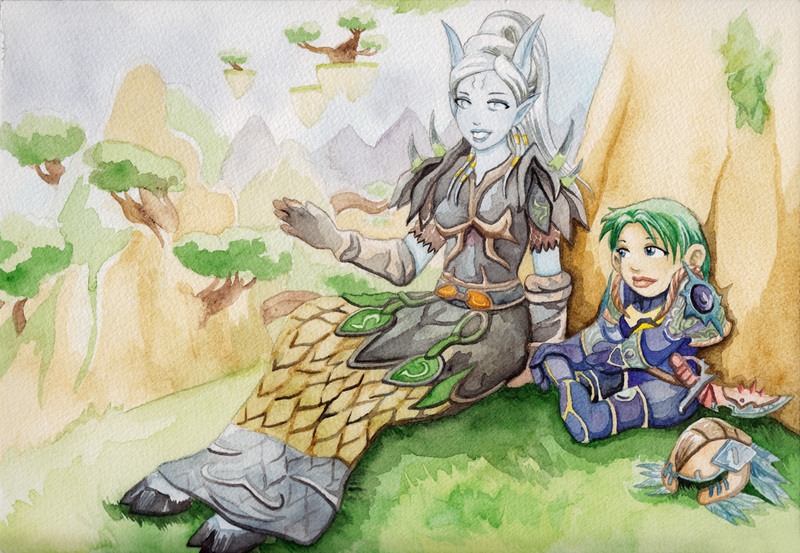 I don’t know how I forgot about posting it, but it seems particularly appropriate now as many folks endeavor to recapture and revisit old content in preparation for Azeroth’s greatest fashion show. I was struck the other day by nostalgia. I don’t think I’ve played any other game so consistently for so long. 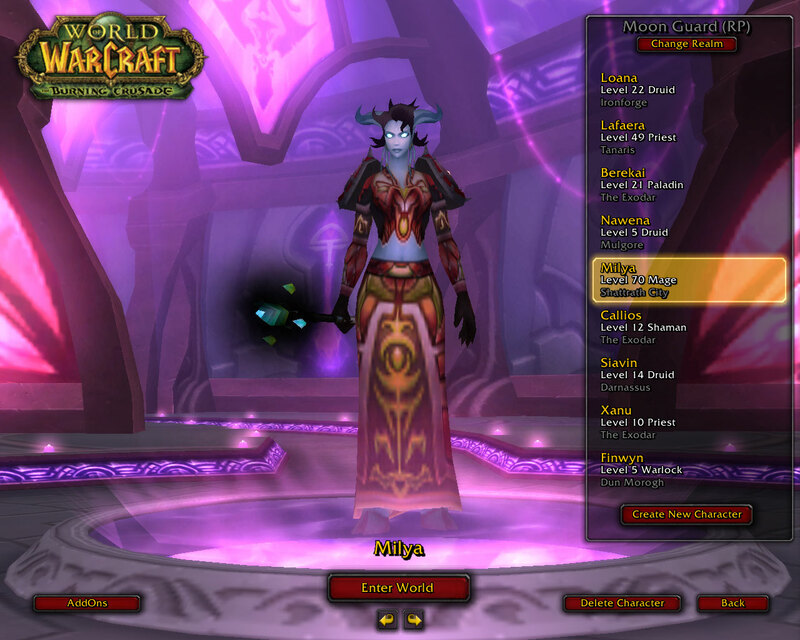 (And I’m not an “old-timer,” I only started at the end of Burning Crusade in approximately May 2008.) But that’s still three years of time! Before I had a talbuk, though, I had my eyes on another prize. 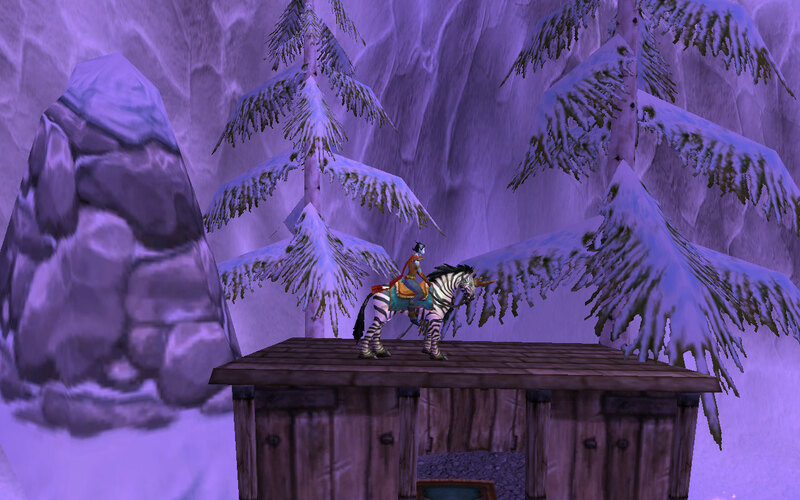 The first time we saw the Barrens I was similarly enamored with the Zhevra. It’s a unicorn, but it’s also a zebra! I was crushed to learn that they weren’t actually available as a mount. 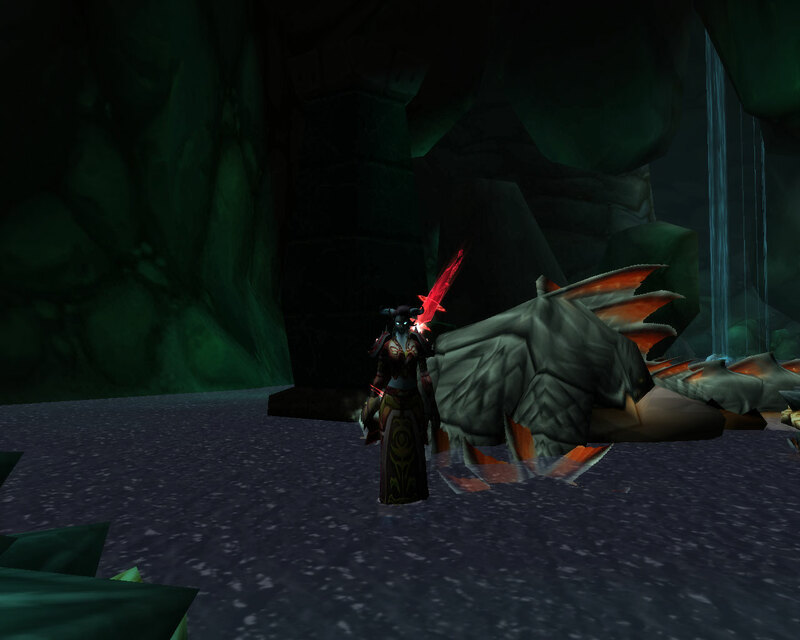 Until about a month later, they were announced as the very first mount reward for Recruit-A-Friend. Naturally, I knew what I had to do. Giant Pink Lipstick of DOOM! Every caster had this, because it was awesome. I still have it in my bank because I am so proud of it. I’d never PvPed before, but I wanted the best thing available to me. It was nice to go to Kara and be passing on stuff because it honestly wasn’t an upgrade. 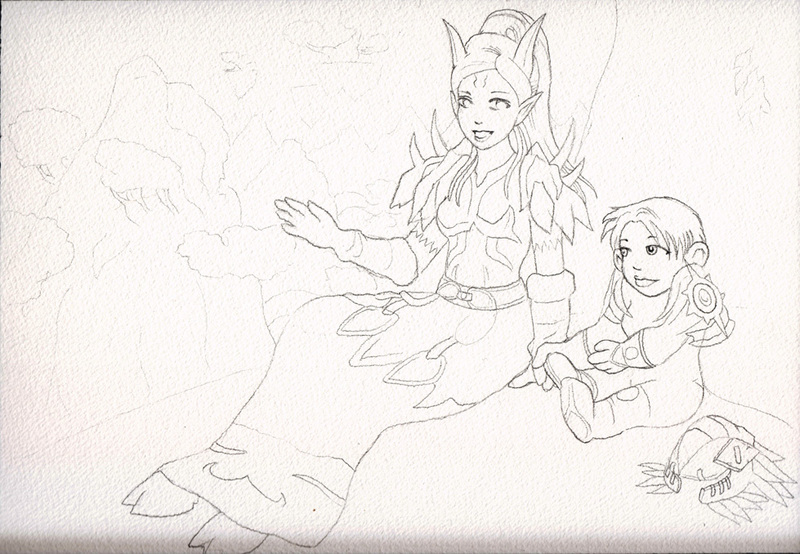 (My obsession with gearing my characters even outside of raiding started really, really early). Firehawks and lynxes and bears, oh my! 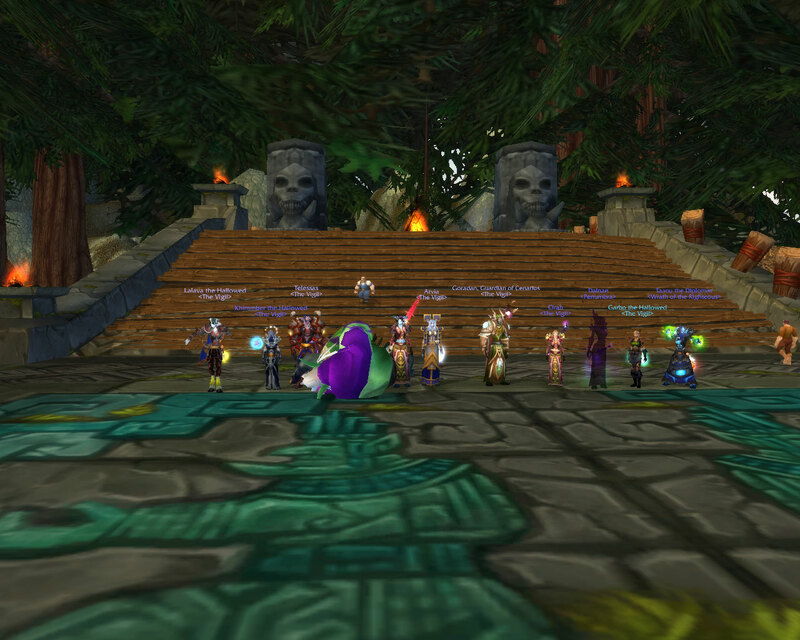 One of my other great memories is going to Zul’aman with our ten-man group and downing it all. I think we missed the nerf by a week; I can’t remember if this was pre or post-nerf but I was so proud that we did it. This was as far as ten-man progression allowed at the time, and we were just a small guild. This screenshot of old friends makes me smile. "Wicked, wicked, mortals! The forest weeps. The elements recoil at the destruction. Ivus must purge you from this world!" In the time I spent doing AV, I got to summon Ivus the Forest Lord not once, but twice! For those who are unfamiliar, you can summon this big bad when an AV match is interminable. It seldom happens now because there are things you need to do beforehand and most AV battles tend to be zergs. This is what the summoning looks like. I unfortunately lack a screenshot of the Horde players flailing around as we rode forward with Ivus ahead of us, scattering players like popcorn. The element of surprise was on our side because I think most of them didn’t even understand what was happening and had never heard of Ivus, let alone seen him. This is still hands-down one of my favourite AV memories. "Oh! I have slipped the surly bonds of earth, and danced the skies on laughter-silvered wings..." (John Gillespie Magee Jr., "High Flight"
Finally, this is a screenshot I just had to include. 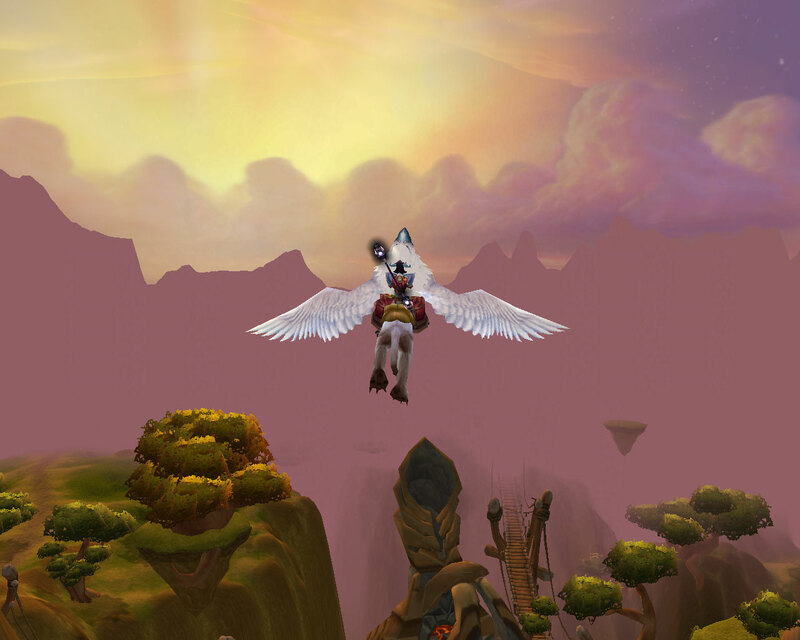 Do you remember how you felt when you were first able to afford a flying mount – any flying mount? Who cared that it wasn’t as fast as the other ones? I imagine for most of us, we’ll never have the actual feeling of piloting a plain or hang-gliding. Yet who isn’t captivated by the idea of flying off into the sky? 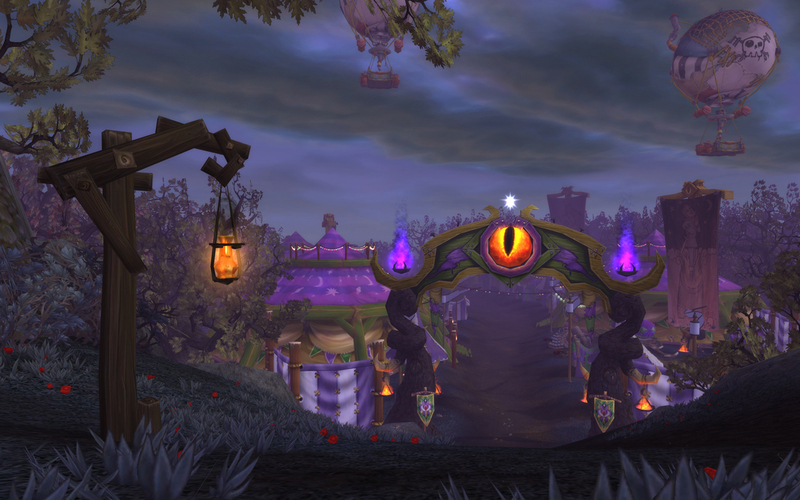 I know some folks are not happy about the changes to Azeroth and the addition of flight. I think that it’s absolutely a shame if you never come down to the earth to pay attention to all of the details and work that’s been put into creating this world. At the same time, I love being able to fly everywhere since the first moment I could fly, and I wouldn’t trade it for anything! Transmogrification! I’m a little late to remark on this news, but I don’t think you have to have known me long to know that I am over the moon about these changes. Finally, all the space I’ve been devoting to gear storage is going to pay off! If you’re newish to my blog you may not have read before I moved here from Pugging Pally. I’d like to call your attention to a fashion contest that I hosted last year around this time: The Well-Dressed Paladin. If you go here to the entry where I announced the winners, you can see a gallery of all the creative entries I received. 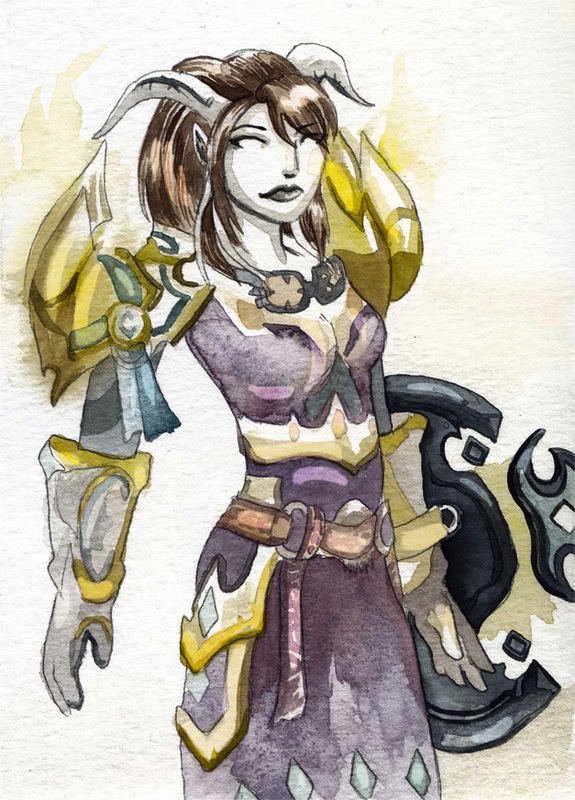 This seems like as good a time as any to revisit some of the unusual and awesome interpretations of paladin fashion – it doesn’t have to be a complete tier set to look great! I’ve had a post about mage clothes in the works for ages, so watch for that soon. Meantime, if you’re anything like me, I’d better let you get back to doing old raid content to help get those last few pieces in your closet. I can’t wait to see the choices people make about their gear when they aren’t obligated to display the latest tier because it’s the best raid gear. I actually have a feeling that a good number of folks will still display T12, or whatever the latest tier is – because it’s a symbol of prestige and it does suit the content we’re doing. As for me, I intend to change the look of my gear probably around once a week or so. The cost of redoing it is a drop in the bucket compared to the enjoyment I expect to derive from hosting my own ongoing fashion show. This Tuesday is going to be a little different, in that it’s just sketches I did quickly. 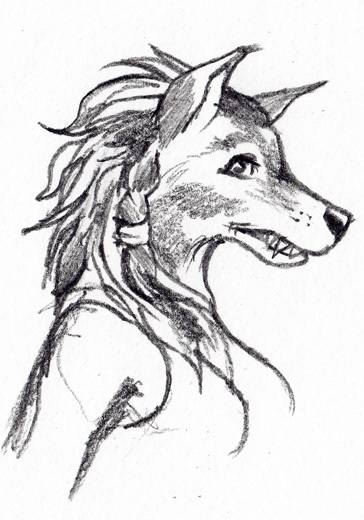 I was doing some idle musing the other day and I started thinking about how disappointed I was with the female worgen. I fully intended to make a worgen when Cataclysm came out. I had two names reserved for the purpose, even (one male, one female). I usually prefer to play female characters, because I just do. I wrote about what happened with my worgen. Similarly to how I felt about being a moonkin, I just couldn’t get “into” the way the worgen looked. I think the males look pretty good (although not keen on their “running wild” animation), but the females? I started sketching to try to understand and explain what it is that bothers me about them. They have these large, heavily-lidded and tilted eyes. Their eyes are looking in different directions, too, much like a Simpsons character. 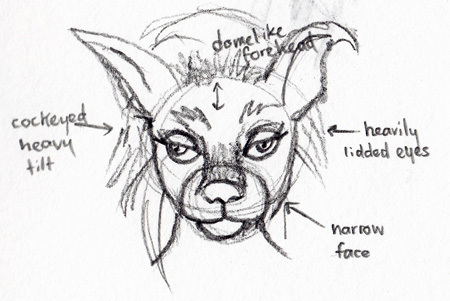 They have a very narrow, “fox-like” face, and a pronounced forehead. 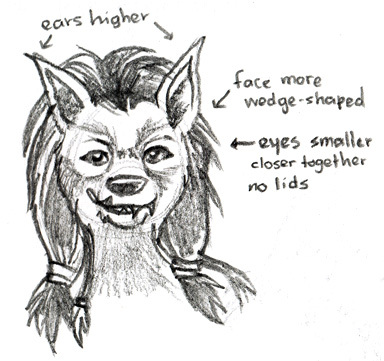 Here is what the worgen actually looks like. What follows is just a series of quick sketches as I tried to work out for myself what I would have preferred (instead of just complaining about what I didn’t like). I really think the biggest thing is the eyes. Lose the heavy lids, make them smaller (and a bit closer to the center of the face). I am still not really happy with the face shape here and would probably keep reworking it if I were actually trying to do honest to goodness concept art. The actual model has its lips pulled back in a permanent snarl, too. I didn't really do that, which is perhaps like cheating. 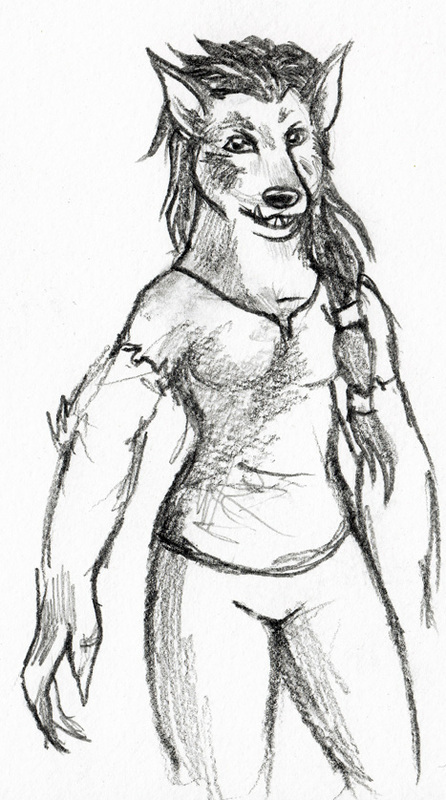 Overall, I just imagine female worgen being more…wolf-like. Their male counterparts are wholly lupine and it works for them. I feel as if maybe the art team just tried too hard to make them “feminine” looking. The thing is, they’re werewolves. I don’t think you can make them look really feminine (or perhaps you shouldn’t). In any case, their reasonably slender frames and mammalian characteristics make that much obvious. I could see them with more of a wolf’s head instead of the “foxy” look they went for. I know that female worgen gave them the most trouble, as they revamped them completely several times during the beta. I’ll be honest; I could see female worgen overall with a bit more meat on their bones. I think they may be overly lanky? But that’s a minor gripe. I should mention that I absolutely love their hands. The in-game model has great hands, with the long, claw-like fingers and nails. I thickened her neck (and also her body, giving her a bit of curve). I still don’t know if I am happy with the face, but it was fun to mess around with. Having completed this exercise, I’m still pretty sure it’s their dead eyes that bug me the most. The dog-like muzzle might be fine if the eyes had a bit of life to them, were placed differently and had a different shape. That’s what I think, anyhow, in my half hour of idle doodling. What do you think? Love worgen the way they are? See them a little bit differently? I have a feeling I am going to keep doing some sketches of them until I can really see them the way I imagine them being. At THAT point I can put a top hat on one.